My 2016 “best nine” according to IG. 2016 was a whirlwind year. I loved. I worried. My heart shattered. I got sick. I figured some things out. I remembered “authentic self” stuff that has helped me re-engage with my values and interests. And so I got better at being me. I worried some more. I got better. I loved. Now, as with most December 31sts, I feel quieter, more restful, more peaceful than celebratory, or loud, or exciting. These are long, cold days. As a species I think we’re supposed to be lying low, eating root vegetables, and conserving energy to get through winter. Still, in a little while, I’ll probably pull on my giant fuzzy snow boots and be with the smiling, happy people. In 2015 I traveled. I felt blocked creatively, and so to occupy myself, I tried to say yes to all of the people I loved, and even liked, and ended up making a few long road trips and even made a solo detour on a trip to visit my best friend and ended up seeing more of the Oregon coast than I’d ever seen before and felt small next to the tsunami warnings and did wheel pose in the warm sand with my mom, whom I love so much. I felt like my urgent travel mode was coming to an end in 2016, but I still ended up traveling a lot. I flew to Louisiana. In February, I road tripped back to Utah through Texas, New Mexico, and Colorado (in the snow!). Then I flew to Houston for a conference that ended up being a good bonding experience with my colleagues, even though I was also really emotionally raw during that trip. I made a quick trip home for my nephew’s birthday (a date I rarely get to make because of my work schedule). Later in the month, I attended another conference in Atlanta. The conference was great, but the trip felt a little solitary. When school finished up, I took off to the high mountains of Idaho, and then made my annual trip to Oregon, came back to Idaho, and then I did another quick trip to Utah. Before school started, I road tripped to Phoenix by way of the Grand Canyon (a first for me! ), Flagstaff and Sedona. In Phoenix I ate some of the best pizza of my life, drove on to the Saguaro National Park outside of Tucson, where I had last been 15 years earlier on my way to a school trip to Mexico. That trip, and the saguaros, left an indelible mark on my psyche, and my return to them did not disappoint. After having my face melted off by a lovely little jazz quartet, I went on to Las Vegas, where I ate at the Peppermill because it’s iconic, and I had recently seen Jerry Seinfeld interview George Wallace there for his show. After school started, I did a quick long weekend in Seattle to visit the loveliest of people, where I felt the humid, highly oxygenated air wash over me, and after that I went back to Las Vegas for a nice little conference that also felt quite solitary, and after that I went to San Diego for another conference, but this time I also got to walk along the warm California beach and see some of the city and just detoured (quite) a bit in general. So, there was a lot of travel, and I was grateful for the good company I was able to keep, and I felt highly motivated at times, editing, grading, book reviewing, and proposing all manor of scholarly work. I also rested. I ate tomatoes and zucchini that I grew myself. I knitted, and I read, and I put seeds out for the birds. There’s more of course, but for now, this is probably all I need to say about 2016. This entry was posted in enlightenment, existence, garden, knitting, life, love, reading, relationships, travel, Uncategorized, work, writing and tagged atlanta, colorado, flagstaff, grand canyon, houston, idaho, las vegas, louisiana, new mexico, new year, Oregon, phoenix, saguaro, san diego, sedona on January 1, 2017 by sherewin. 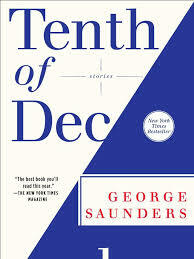 I recently finished a collection of short stories by George Saunders called Tenth of December. I’ve never read Saunders before and didn’t intend to, but I saw the title in a favorite new and used bookstore and had to pick it up. I’ve always loved the bookstore. It used to be called Earth ‘N Book in La Grande, Oregon. Years ago, it changed hands, and I felt that it wasn’t quite what it used to be. However, I popped my head in on a recent visit to Oregon, and it drew me in—just like a good new and used bookstore (is there any other kind?) always does. Tenth of December starts with a short story called “Victory Lap,” which is absolutely stunning. It is hilarious and traumatic—something Saunders does very well. He also has a distinct and innovative voice, but doesn’t seem like he’s trying too hard—which means he was probably trying very, very hard. I know that seems so very nonspecific, so I’ll try to elaborate. Saunders does this thing where he integrates these informal aspects of text-speak and typing. So, for example, the “ha ha has” we get when we’re chatting or texting are integrated into his work in a profound and poetic, but (of course) understated way. There are a few good authors who are absolutely genius with their ability to make the colloquial profound (Raymond Carver is among them), and Saunders does that too. But, what’s most interesting, I think, is the way he integrates a really modern colloquial that is clearly influenced by the way changing and omnipresent technology evolves our language. “Victory Lap” was probably my favorite piece. I also really appreciated “Puppy.” In my opinion, a few pieces were too dark and/or difficult for their payoff, but I am particularly sensitive to such things. As you, dear readers, may recall, I am making an effort to read mostly female authors for the time being. It’s difficult to describe why exactly, but suffice it to say that for my current creative endeavors, I want to have the voices of women in my head. Despite that current constraint, I picked up and read Tenth of December as quickly as I could. When Z arrived in Oregon, I kept reading it for several days, trying to finish in case he wanted to take it with him on his bike trek. Though it was an emotional rollercoaster, I’m glad I read it. I’m also glad I’ve given it as a gift. I won’t mind that it is in someone else’s care for awhile. This entry was posted in books, reading and tagged book club, George Saunders, Oregon, Tenth of December on July 16, 2014 by sherewin.